These light and sweet puddings will make the perfect end to a meal! The cool refreshing ice-cream is a good way to end a summer time meal especially when mangoes are in season. Beat the egg yolks and 1/3 of the sugar very well until thick and pale yellow. Beat the egg whites until just stiff and gradually beat in the last 1/3 of the sugar to make a stiff meringue. Beat the cream until stiff and gently stir the three mixtures until evenly combined. Pour into a container with a lid, suitable for freezing. Freeze the ice-cream at least 6 hours or preferably overnight until completely frozen. Serve as is or with passion fruit. About 2 liters or 10 to 12 servings. Recipe by Carolié de Koster from Art Of Cooking p. 536. This cake batter can be prepared the night before and stored in the fridge in a Tupperware container with a lid. Remove the batter from the fridge 30 minutes before you want to bake it and transfer it to a greased ovenproof dish. Preheat the oven to 180 degrees celsius and grease a 20 cm square ovenproof dish with non-stick cooking spray. Cream the butter, orange or lemon zest and the sugar in a mixing bowl until light and fluffy. Combine the flour, baking powder and salt in a second mixing bowl and add the flour mixture to the batter a little at a time, alternating with the buttermilk. Stir in the blueberries and spoon the batter into the dish. Sprinkle 15 ml sugar on top of the batter and bake for 35 minutes. Check for doneness by inserting a toothpick. It should come out clean. If necessary, return the dish to oven. When cooked, remove the dish from the oven and set it aside to cool for at least 15 minutes before serving. 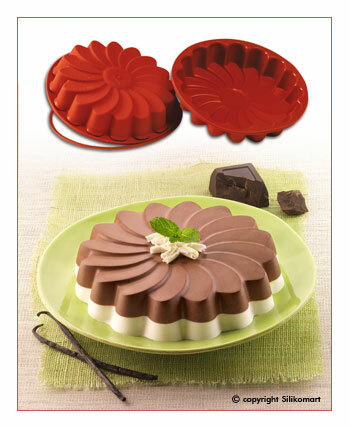 This light dessert can easily be adapted to the type of event you are making it for by using smaller moulds for individual portions or a large mould. 2.5 ml flavouring, e.g. vanilla essence, almond essence, etc. Heat the milk and sugar in a medium saucepan. Do not let the milk boil! Stir with a large spoon to dissolve the sugar. Measure the gelatine with a 30 ml measuring cup and transfer it to a heatproof measuring jug with a 500 ml capacity. Add the water and gelatine to a measuring jug and microwave it on Medium for 30 seconds to 1 minute or until the gelatine is melted. Add the gelatine mixture to the milk. Add the salt, flavouring and colouring and taste. Add more essence if preferred. Rinse 6 to 8 individual silicone moulds (100 – 200 ml each) or one large silicone mould (1,5 liter capacity) with cold water and place it on a baking tray. Pour the mixture into the mould(s) and set it aside to cool. Cover the mould(s) with cling film and refrigerate for 4 to 6 hours or until completely set. Bigger moulds will take longer to set. When ready to unmould, lower the mould(s) into a dish with hot water for a few seconds to make unmoulding easier. 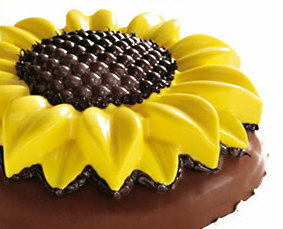 Turn out the mould(s) onto individual plates or onto a large serving platter and garnish with fresh mint leaves, seasonal fruit or chocolate (see the Sunflower-shaped pudding photo below). Use other essence flavours such as coconut, lemon, vanilla, orange, coffee or strawberry and add a few drops food colouring to the milk mixture that complements the flavour, e.g. pink with strawberry, yellow with lemon, etc. This recipe has been adapted from the Almond Jelly & Fruit Recipe in the Art Of Cooking recipe book p. 532. 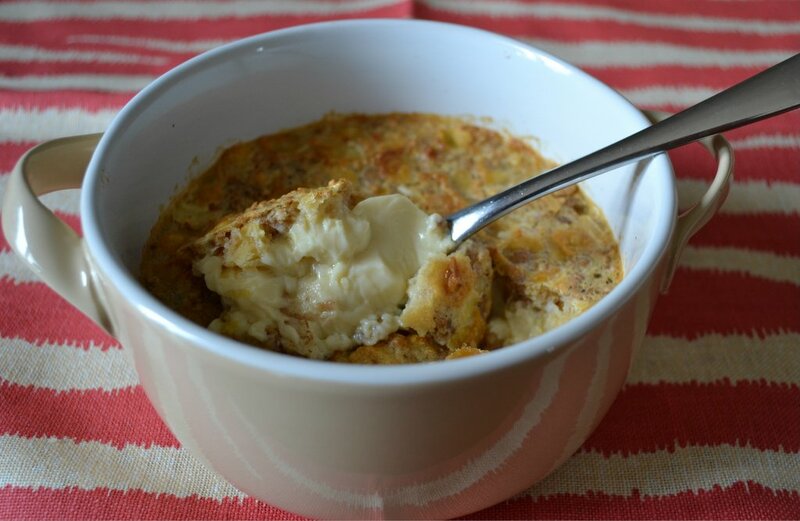 A typical Asian cuisine baked custard. The taste and texture is irresistible. Serve after a meal which did not include many eggs, milk or cream. 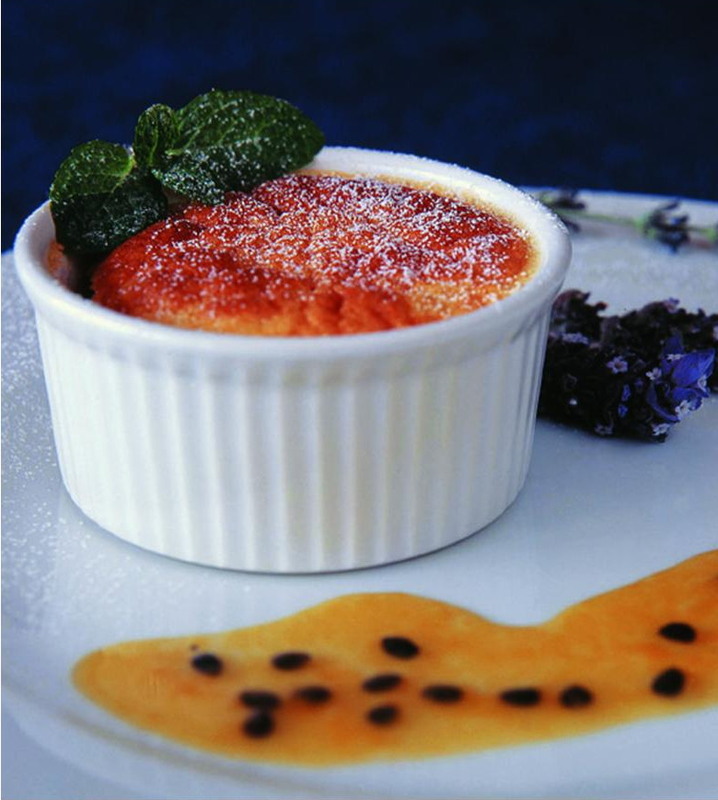 Serve as is or with a bowl of any appropriate fruit or fruit sauce – such as passion fruit in syrup or a lightly sweetened fresh fruit puree. Place the coconut, milk and cardamom pods into a heavy saucepan and bring to boil. Reduce heat and simmer 5 minutes. Allow to cool and stand 10 minutes to allow the flavours to infuse the milk. Strain the milk through a fine sieve and press out as much milk as possible from the coconut. Add the egg, sugar, cream and salt and beat together very well. Strain the mixture again to remove any particles from the eggs. Pour the mixture into 6 – 8 individual ovenproof ramekin dishes, stand in a pan with hot water and sprinkle with nutmeg if used. Bake at 160°C for about 35 minutes or until light golden brown on top and set. Open the door and cool in the oven for 10 minutes. Allow to cool and refrigerate in a sealed container for at least several hours or overnight or up to 2 days. Serve with small spoons from the ramekin dishes or turn out and serve on a plate or in a bowl accompanied by fruit or fruit sauce and garnished as preferred. Recipe by Carolié de Koster from Art Of Cooking page 524. 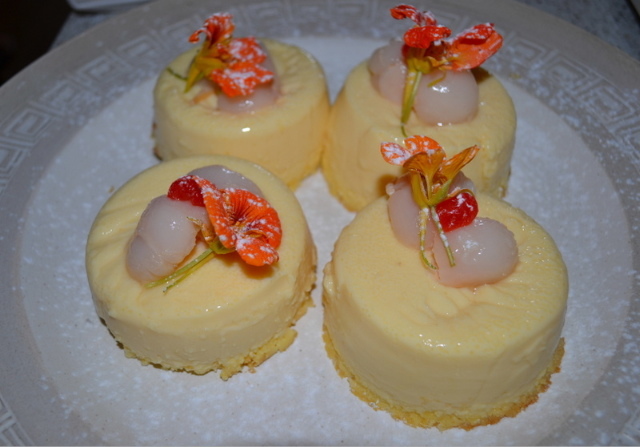 A spongy cake-like topping forms on top of a creamy custard base – delicious either slightly warm with ice-cream and/or cream or cold with whipped cream and fresh fruit as garnish. The batter for this pudding may also be baked in small ramekin dishes for about half the time required for the large pudding. Pour the contents of the tin of grenadilla pulp into a small bowl. Separate the eggs, adding the yolks to the pulp and the whites to a separate mixing bowl. Beat the egg whites until firm and the yolks and pulp lightly. Place the butter and sugar into a bowl and beat well until creamy. Add the yolk and grenadilla mixture gradually, beating until all is evenly mixed, then beat in the milk. Pour the mixture into the bowl with the egg white and fold together gently until combined. Pour the mixture into a deep round ovenproof dish with at least 1,5 litres and place the dish into a suitable pan yo bake in a water bath. Pour enough hot water into the pan to come halfway up the sides of the dish and bake at 170 º C for about 40 minutes for the round and slightly less for the rectangular dish or until set and golden brown on top. Remove the pudding from the oven and the water, cool partly to serve warm or cool completely and refrigerate to serve cold. 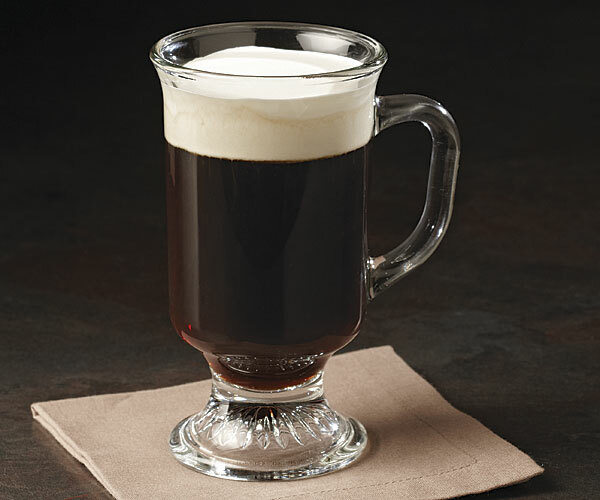 Beat together the cream and the sugar until thickened but still pouring consistency and pour into a jug for serving. 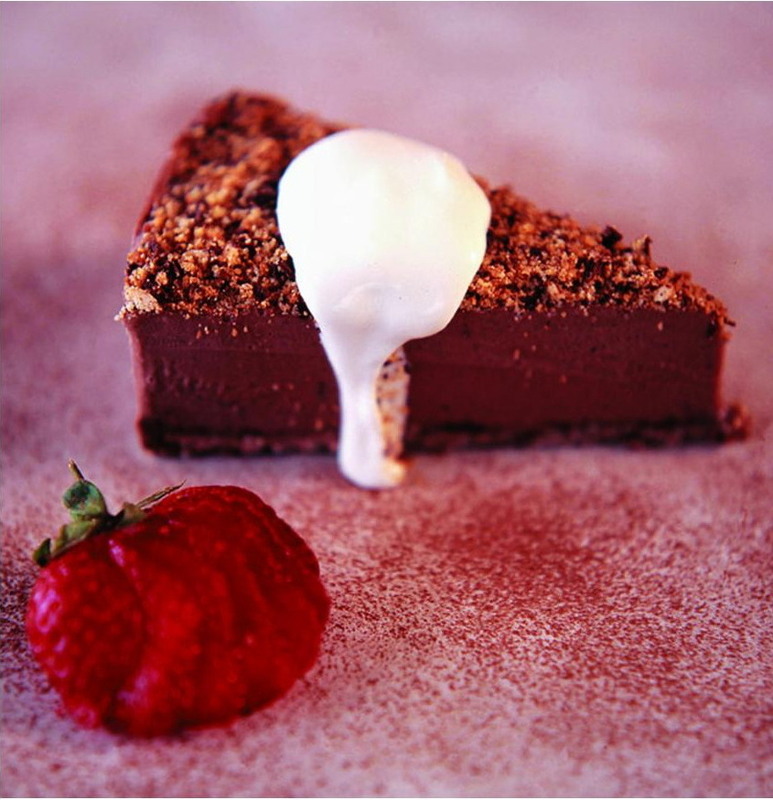 Recipe by Carolié de Koster from Art Of Cooking page p. 510. This classic English dessert is tart and sweet at the same time. 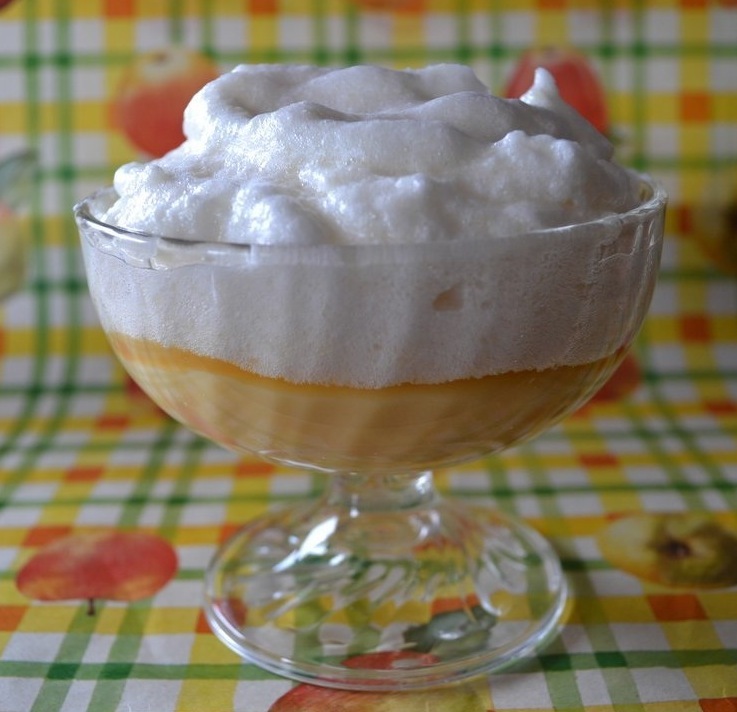 Traditionally, fruit fool is made by folding pureed stewed fruit (classically made from gooseberries) into sweet custard. This recipe has a modern twist and is light and no too rich – the perfect end to a meal. Place the gooseberries in a saucepan with a splash of water. Heat gently, stirring, then bring to a simmer and cook until the fruit starts to burst. Squash the gooseberries with a potato masher or fork until pulpy. Set the saucepan aside to cool then chill in the fridge for at least 30 minutes. Combine the yoghurt, honey or icing sugar and vanilla in a bowl. Add the cold purée to the yoghurt in the bowl and combine lightly without mixing too well so that the yoghurt has a yoghurt ripple. Divide the mixture between 4 serving glasses, cover the glasses with clingfilm and chill untill you’re ready to serve. See my post In Season: Gooseberries for more information. 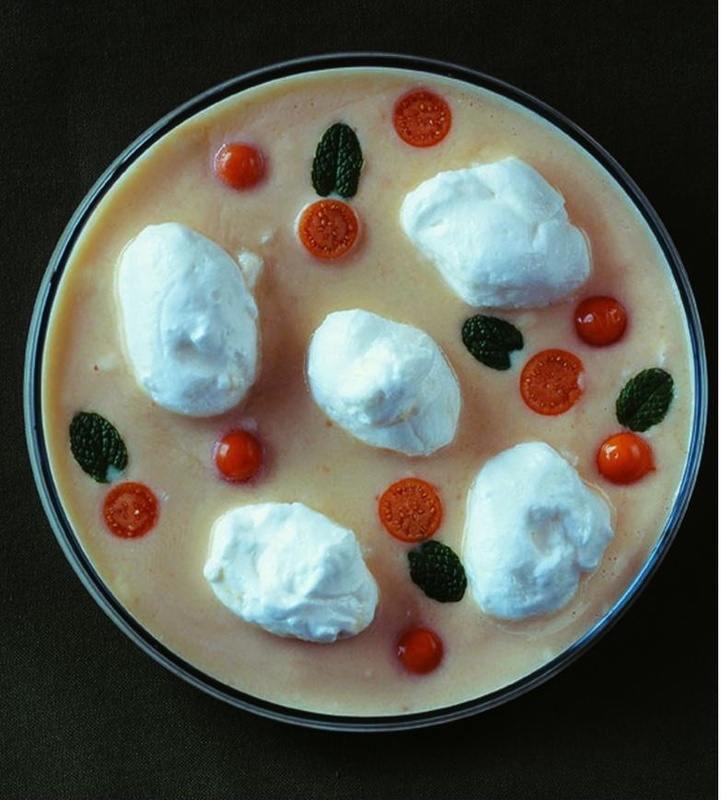 If you have a copy of Carolié de Koster’s Art OF Cooking Recipe Book, you can also try the Poached meringue with golden gooseberry custard (Art Of Cooking p. 560). Using goat’s cheese instead of only cream gives this popular Italian dessert an interesting twist. It works well as an appetizer of as part of a cheese platter. It can also easily be turned into a dessert. Combine the gelatine powder and water in an ovenproof jug and microwave on medium for 30 to 60 seconds until melted. Do not let the mixture boil. Transfer the goats cheese, cream and cottage cheese to the bowl of a food processor and process until smooth. Stir a little of the creamy mixture into the gelatine and pour the melted gelatine into the bowl. Process until smooth and pour into a silicon mould or 8 to 10 individual glass bowls or into a large mould or bowl. Refrigerate for at least 3 hours or preferably overnight to allow the pannacotta to set completely. To serve, turn the pannacotta out onto individual plates or a large serving platter and surround with savoury or sweet biscuits and bowls of green fig or melon preserves, pickles or peppadews. 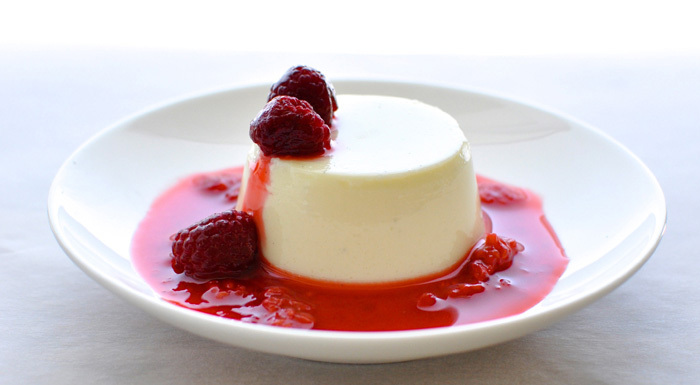 To make sweet panna cotta, add 1 ml vanilla extract and 200 ml icing sugar to the mixture before spooning it into the dish(es). 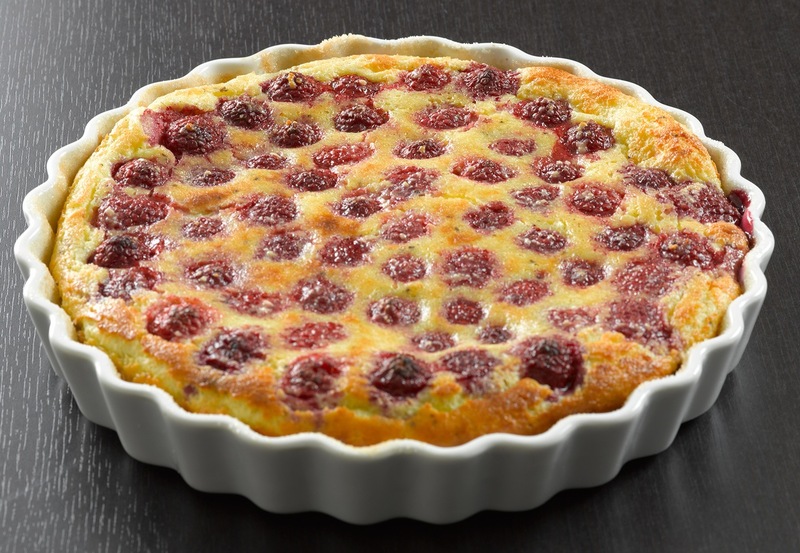 Serve with fresh seasonal fruit such as gooseberries, raspberries, blueberries or strawberries or fruit coulis. See my post Say Cheese for more information on goat cheese and cheese-making courses. 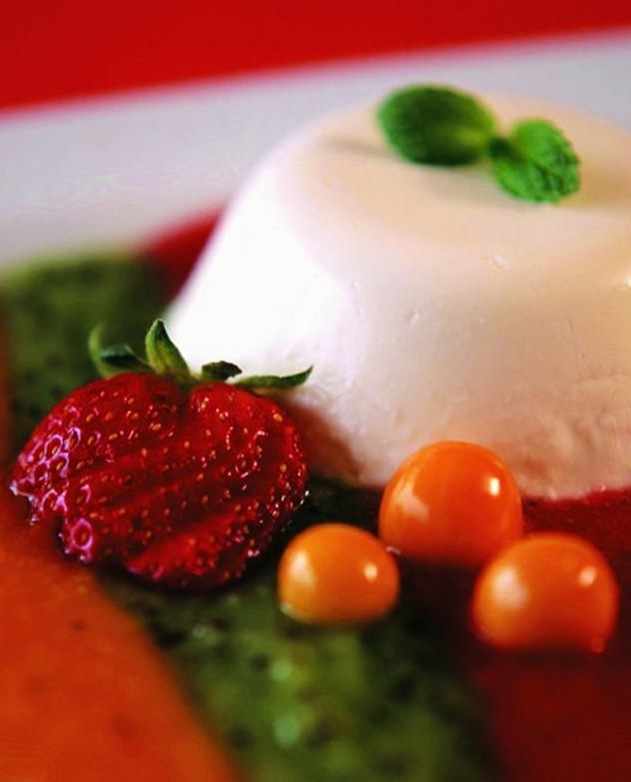 A moulded pure white dessert nestles on a freestyle, colourful palette of the freshest fruit purees. The fruit used will vary with the seasons and the same platter will never be repeated precisely! Any fruit sauces in bold colours do justice to this fine dessert. You can definitely use a chocolate sauce too! additional garnish as preferred, e.g. fresh strawberries, gooseberries, blueberries, etc. Heat the milk very gently with the cinnamon sticks until it starts to boil. Remove from heat, stir in the almond essence and sugar and allow to stand a while to infuse, then strain through a fine sieve. Cover the gelatine with water in a jug and microwave on MEDIUM for 30 seconds – 1 minute until melted. Take care that the gelatine does not boil over. Alternatively, place the gelatine and water into a bowl set over the steam of simmering water and leave a few minutes or until melted. Stir the gelatine into the hot milk and allow to cool to room temperature. Place the Mascarpone cheese into a bowl and beat in the milk gradually using a whisk or electric beater, until evenly blended. Refrigerate the mixture at least 30 minutes while checking from time to time until it just starts to set. Beat the cream until stiff and fold into the partly set mixture until evenly blended. Divide the mixture between 6 to 8 ramekin dishes, smooth tops, cover and refrigerate at least 2 hours or until quite firm. In the meantime prepare the fruit purees. Peel and stone or seed the fresh fruit and liquidise each kind of fruit separately to obtain a smooth puree. If necessary e.g. with gooseberries, pass the puree through a coarse strainer to remove the seeds. Sweeten to taste – the amount of sugar added will vary greatly depending on the acidity of the fruit and personal preference. To serve, loosen the sides of the moulds and turn out onto the centre of a suitable serving platter. Place about 50 ml of each puree around the mould and spread with a teaspoon if necessary to cover the plate thinly but neatly and just meet at the edges without mingling. Garnish as preferred. This delicious dessert is sure to impress young and old! Apple snow – The apple snow on it’s own is an ultra light and fresh dessert! 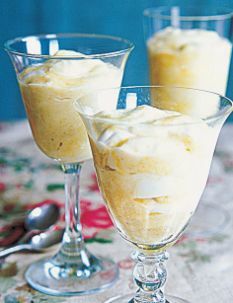 Apple snow on custard – Spooned onto cooled custard which also utilises the egg yolks turns it into a delightful dessert!! Frozen apple snow – The two layers mixed together, with or without extra whipped cream, turns it all into an irresistible apple ice-cream!!! Place the apple and water in a saucepan and simmer gently until the apple is tender or place in a jug, cover partly and microwave on High until the apple has softened. Process or mash until a smooth apple sauce is obtained. Combine the sugar, salt and additional water and bring to boil. Simmer one minute or until syrupy. Meanwhile, beat the egg whites until stiff and slowly pour in the warm syrup while beating until shiny and stiff peaks form. Fold in the apple sauce and refrigerate. To serve plain, spoon into stemmed glasses and serve or prepare the custard as explained below and then complete the dessert. In the microwave oven, heat the milk to boiling point. Beat together the egg yolks, sugar, salt and cornflour in a large ovenproof bowl or jug and add the hot milk. Microwave on HIGH for 1 minute or until the mixture just starts too thicken. Beat well and microwave 30 seconds – 1 minute more or until the mixture is thick and bubbly. Beat well and allow to cool a while. Remove skin if necessary and pour into a dessert bowl or individual stemmed bowls. Cool to room temperature and top with apple snow. Refrigerate until ready to serve. To prepare the apple ice cream, mix the cooled custard and apple snow and freeze until icicles form (about 2 hours). Beat very well to break up icicles and freeze again. 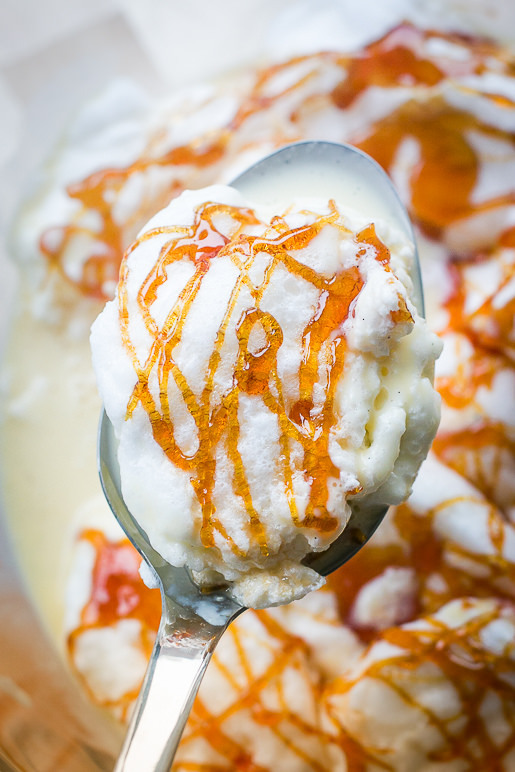 For a richer creamier ice cream, add the whipped cream, sweetened with the sugar and flavoured with the extra vanilla and mix in thoroughly before the final freezing stage. Freeze at least 3 – 4 hours before serving. 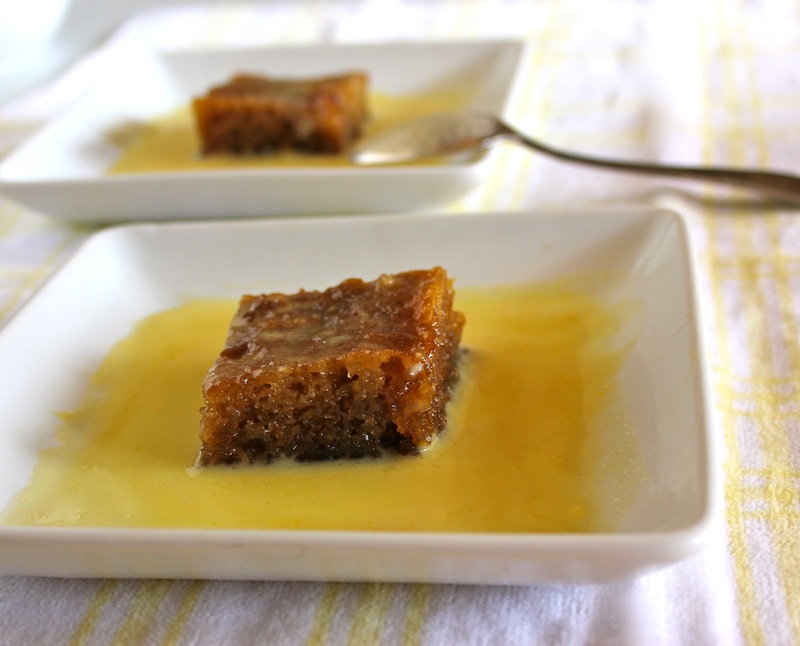 Malva pudding has a moist, sponge-like texture, but due to the fact that the syrup is poured over the cake and it is baked a second time, it is considered a pudding rather than a cake. 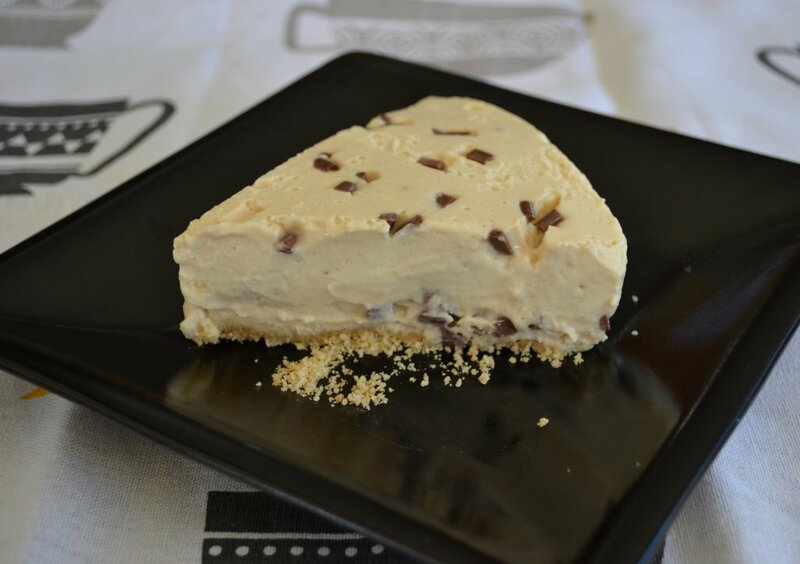 The pudding can be served on its own, often sliced into squares or simply scooped into shallow bowls, it can also be served with custard and/or ice-cream. Pre-heat the oven to 180 º C and grease a 20 x 20 cm square, oval or round ovenproof dish with non-stick cooking spray. Cream the butter and sugar in a large mixing bowl with an electric hand mixer. Stir in the cake flour and milk and mix well. Add the egg, lemon juice, bicarbonate of soda and apricot jam to the mixing bowl. Pour the batter into the ovenproof dish and bake for 1 hour. To make the syrup, combine all the ingredients in a medium saucepan and boil for about two minutes. Remove the pudding from the oven and pour the syrup over the hot pudding.Return the pudding to the oven and bake for a further 10 minutes. 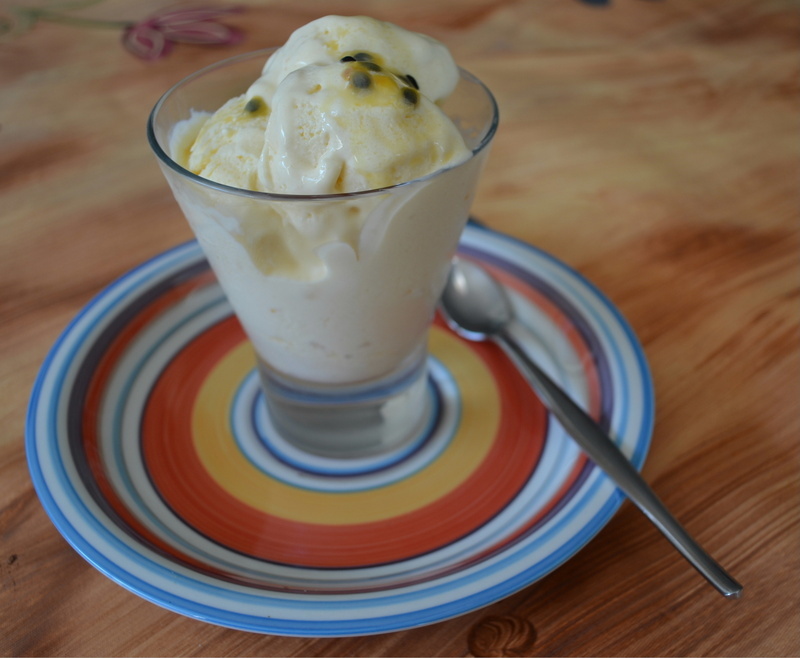 Serve warm or at room temperature with custard or ice-cream. 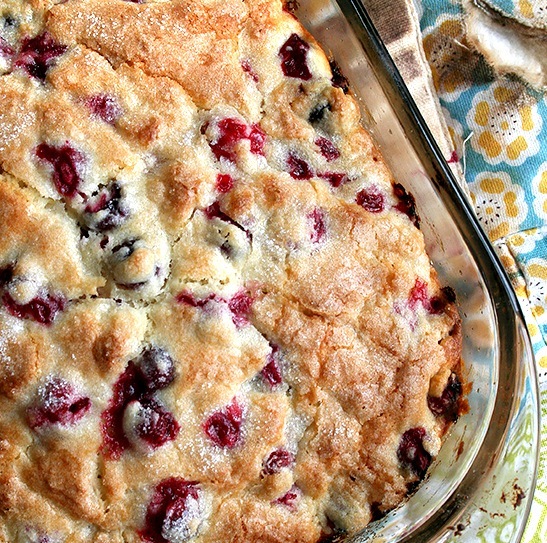 Young and old will find this bake delightful as a dessert – served hot or cold. It can also serve as an all-in-one breakfast dish with cereal, eggs and milk included. Preheat the oven to 160ºC. Have ready a 1 liter ovenproof dish and sprinkle the cereal onto the base of the dish or use 4 individual (± 200 ml) ovenproof dishes and divide the cereal between the four dishes. Beat together the milk, sugar, salt, eggs and vanilla essence and pour it over the clusters. Place the dish or dishes into an ovenproof dish of a suitable size and pour warm water into it to come halfway up the sides of the dish or dishes. Bake the custards for about 20 minutes for the small or 30 minutes for the big dish until set. 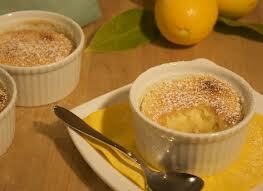 Serve warm, dusted with icing sugar and drizzled with honey if preferred or allow to cool and serve cold or chilled.